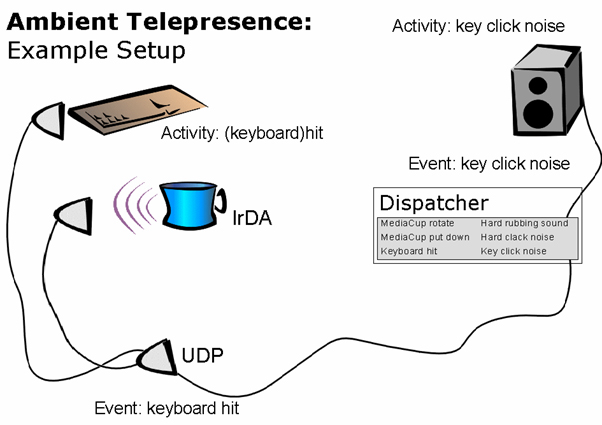 AmbientTelepresence researched the possibility to build up a ambient presence of remote people using a Ubiquitous Computing environment instrumented with embedded devices rather than with video or audio transmission. “Ambient Telepresence is a method to give someone the feeling that someone else is present while they are not co-located”. The project showed that transfer of (selected) ambient events are less obtrusive and allows for a more fine grained, continuous awareness of remote persons. Technically the prototype connects remote sites using the events from the MediaCup and consumer electronics and reproduces an ambient awareness using sound.